Start Your Own Business In One Easy Step! Entrepreneur Magazine has a list of 5 steps every successful business startup has gone through, which I will briefly put here as a courtesy. An unnecessary courtesy if you just scroll below to the genius who tried to cut through all the read tape and just write a $300 billion check to get it all started. Look for that "aha" moment. Like, "Aha, this guy is trying to cash a $300 billion dollar check!" Value your business. Let's see, How's $300 billion? Find the right location. Florida. Find your first customers. This guy's restaurant would have served 30 million customers at once. But now we'll never know. 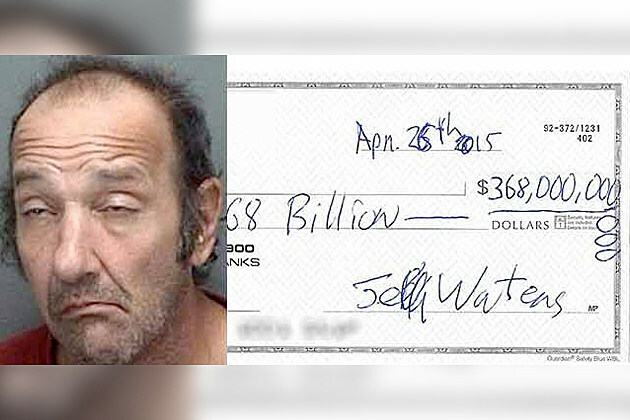 Meet Jeff Waters, he walked into a Bank of America Monday morning and attempted to cash a check for $368,000,000,000 dollars.